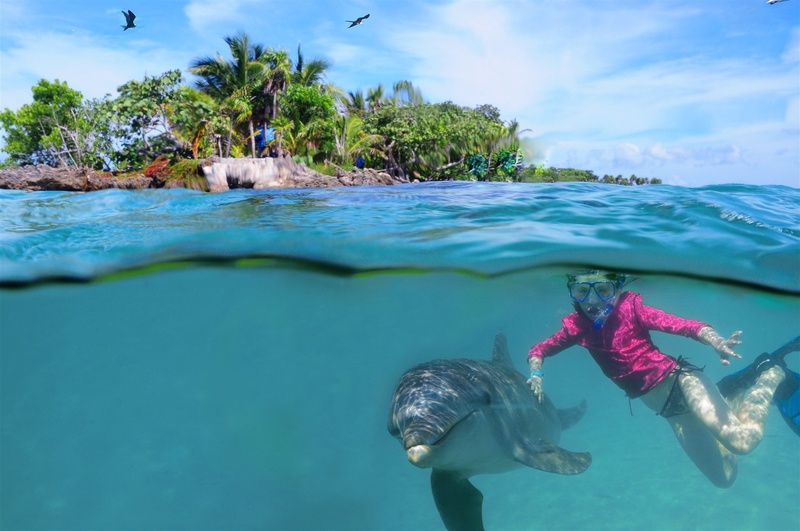 Experience a dolphin interaction activity like no other! On this unstructured dolphin activity, the naturally curious dolphins are free to interact with you as they choose! Your Dolphin Snorkel begins as you travel across the resort's lagoon to Bailey’s Key, the private home to a large family of Atlantic Bottlenose dolphins. At a beach-front cabana a brief orientation will be given, and then you'll walk along a white sandy beach to wade waist deep into the gin-clear waters of the Caribbean where a trained naturalist will give you a personal introduction to a resident dolphin. The trainer will describe the dolphins’ characteristics, anatomy, and behaviors and will give you the opportunity to touch, kiss and play with a member of this friendly family of marine mammals. During the 30-minute encounter portion, you'll have excellent photo opportunities in addition to professional photographs that will be taken of you and your new friends. Following the encounter, you’ll snorkel with limited number of fellow participants for approximately 30 minutes with over a dozen resident dolphins within the enclosure. The snorkel session will provide maximum opportunities for physical contact with the dolphins. If the dolphins choose not to interact, there is a private area for them within the two-acre enclosure. Participants must be 8 years of age or older and be accompanied by a parent or guardian while snorkeling to participate. Participants should be familiar with the use of mask, fins, and snorkel. Must have prior snorkeling experience. Cameras or video are not allowed in the water during the snorkel session.